Peoples Projects Finalist - We need your votes to win Â£50,000! We're so excited to be in the final 5 in the Anglia West region of the Peoples Projects! We need as many votes as possible to win £50,000 to fund a fantastic wellbeing project for the next 12 months, helping more people to meet our lovely horses. Voting opens on Monday April 1st at 9am and closes on April 15th at midday. Follow us on Facebook to find out 50 reasons for us to get £50,000. Don't forget to share the posts, and encourage everyone to vote! Running from now to February 2019. Dates now set for Mindfulness workshops! Free sessions on Tuesday mornings for people living with dementia and their partner or support worker. Come and enjoy a morning in the countryside and enjoy the company of our friendly horses. Email us for more details. It is with great sadness that we let you know that we had to say goodbye to Wag on April 18th. Having battled through a serious eye injury with her usual strength of character, she then suffered kidney failure and the end was very quick. She was 26 years old. Wag was one of the founding horses of Horses Helping People. She had lived with Debbie since 1996, having travelled over from her native California as a two year old - manyof you will remember the distinctive brand she had on her shoulder from the E Bar ranch. Her first job was as a Western riding teacher, and she was beautifully sensitive to ride. She had the incredible speed of a Quarter Horse - you could sometimes see her galloping round the field apparently at top speed, then she would effortlessly go up a few gears to go even faster! As a therapeutic horse she was very communicative, especially enjoying showing people where she wanted to be groomed or scratched. She was a very confident horse who was happy working with a variety of clients, both children and adults. She was not perturbed by erratic behaviour, but this doesn't mean she was desensitised - she was very aware and responsive to more sensitive people. She also had a role as aerobics instructor, where she would demonstrate moves for a group of special needs children to follow! Her last session with a client was two days before she died. Wag had noticed that her human friend was learning to do massages, and fixed her with a hard stare, demanding to be chosen! So Wag got her massage, curling her head and neck round her new friend in a horse hug to say thankyou. She was a fine example of how a leader doesn't have to be obviously dominant. She was always head of the herd, but often people didn't pick her out as the leader because she had a quiet authority that meant she didn't feel the need to keep proving it. However, if any herd member stepped over her boundaries, she was quick and clear in her reminder! The only area in which she had no boundaries was with her daughter, Goldie, who got away with all kinds of behaviour! Late motherhood came as something of a surprise to Wag. Horses usually like to give birth in private but, when Goldie was due, Wag telepathically woke Debbie at midnight and waited until Debbie and Dave arrived at her stable, then lay down and delivered Goldie at their feet. Goldie is now 8, and still part of the Horses Heping People herd. We lose a valued member of our team, a friend, and also a big part of our family for 20 years. Hope she is reunited with Buddy in the big meadow in the sky. 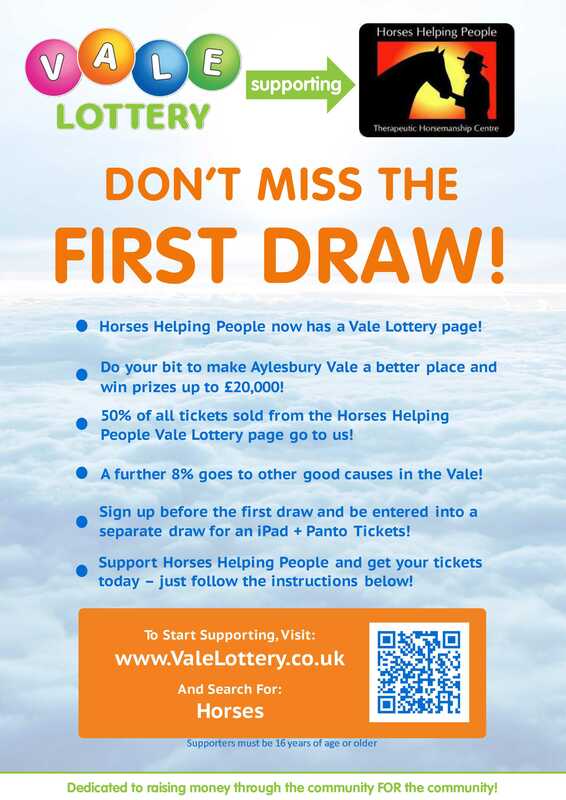 A chance to win Â£20,000 by supporting Horses Helping People! We are very sad to say we had to have our lovely Buddy put to sleep on 16th May at the age of 29. She was a founder of Horses Helping People and has helped countless people over the years. We are all missing her, but thankful to have shared our lives with such an amazing spirit. Our next five day professional training course is running September 15th - 19th. Ideal for people wanting to find out more about therapeutic horsemanship as a career. Places are limited, so contact us asap to reserve your place. Last chance to train with us at current prices. Due to demand, we are running an additional 5 day professional training course Mon 30th June - Fri July 4th. Email us if you would like to join us on the course - places limited. Our next five day professional training course is running from April 28th - May 2nd. Ideal for anyone wanting to pursue a career in therpaeutic horsemanship. Only 2 spaces remaining - contact us asap if you are interested in joining us.